Mr. President, many people in history have used the name of Jesus Christ to accomplish evil things for their own desires. But Jesus taught peace, love and forgiveness. He came to give His life for the sins of mankind, not to take life. Muhammad, on the contrary, was a warrior and killed many innocent people. True followers of Christ emulate Christ — true followers of Muhammad emulate Muhammad. Pray earnestly for the nation. Live out their faith boldly. Take a stand for righteousness. Be salt and light for the nation. The only hope for this country is Almighty God and His Son. We can't sit idly by any longer. LGBT activists, abortion rights advocates, aggressive atheist groups, and others who ignore God's Word are trying to shove their agenda down our throats. We need to take every opportunity to speak up for biblical standards and let our lights shine. We need to work to preserve our religious freedoms so that we can continue to proclaim the Gospel freely. If we as Christians stand together and let our voice be heard, I believe God can use us to make a difference. I hope you will start praying with us now. We need to praise God for this courageous Christian leader. We need to pray for his safety, and we need to pray for the success of his national tour next year. I would urge all of you to get involved in the prayer rally that is scheduled for your state. You can sign up for updates regarding the rally in your state at http://billygraham.org/decision-america-tour. In the meantime, each of us who profess to be Christians need to be willing to stand up and be counted in behalf of Jesus and God's Word. 39) Andra Varin, "Franklin Graham: Obama Has 'Shaken His Fist' at God," Newsmax, 05/10/2012, www.newsmax.com/Newsfront/franklin-graham-obama-gay/2012/05/10/id/438661. 40) Alexandra Jaffe, "Obama takes fire for Crusades comparison," CNN, 02/07/2015, www.cnn.com/2015/02/06/politics/obama-isis-crusades-comparison, page 3. 41) Jessilyn Justice, "Franklin graham Rebukes Obama," CharismaNews, 02/09/2015, www.charismanews.com/us/48219-franklin-graham-rebukes-obama. 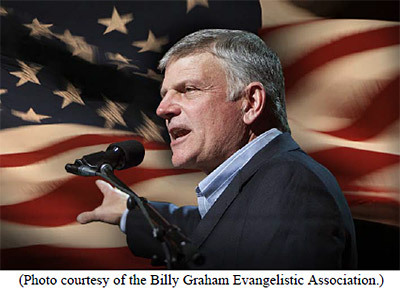 42) Billy Graham Evangelistic Association, "Franklin Graham Launching 50-State Decision America Tour in 2016," 04/15/2015, http://billygraham.org/story/franklin-graham-launching-50-city-tour-in-2016. 44) Kyle Mantyla, "Franklin Graham To Save America With Right-Wing 'Prayer Rallies' In All 50 States Before 2016 Election," Right Wing Watch, 05/12/2015, www.rightwingwatch.org/content/franklin-graham-save-america-right-wing-prayer-rallies-all-50-states-2016-election.